As this is the 42nd tale and we all know the special meaning of the number “42” – after all it is the not yet fully understood answer to life, the universe and everything 🙂 – let me celebrate this occasion by telling you another one of my favourite Mongolian animal tales. In times long past, two horses that had been sold to a place far away longed for home. But while they were on their way home, one of the horses had grown old and then one day it stayed behind as it could not go any further. “Now, little brother, be good and always follow the road. Your aged, older brother is going to die. Little brother, do not wander off the road. Do not approach things that you can only dimly see. Do not untie a bundle’s opening.” In this way the old horse instructed his brother and then it fell behind. 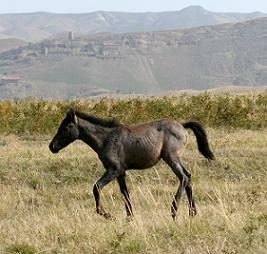 The young horse slowly and hesitantly continued on its way. But then it saw the shape of something it could only dimly see, it is told. The horse wanted to explore the mysterious thing and ran impatiently towards the shape. It turned out to be a bundle and whatever was inside it, made it move about. “Whatever that may be,” thought the young horse. It could not wait any longer and untied the opening at once. Immediately, a big, hungry, brown wolf jumped out. And because the wolf was so eager to eat both the horse and the hare, he did not hesitate but to crawl back into the bundle until only his head was still visible. “See, your head does not fit into the bundle!” cried the hare. The wolf hurried to pull his head inside the bundle. The hare, though, rushed to tie the opening closed again. And this is how the horse was saved by the grace of the clever if small hare and it lived well and happy, so people say. This animal tale is not only lovely but also very interesting from a folkloristic point of view because it merges two types of Mongolian animal tale. The latter part of the tale represents a type that you already know from the tiny tale of fox, birdie and dog and the magpie’s confrontation with the fox. It can be characterized by the following protagonists and plot: One animal threatens another one which is helpless but then saved by a third animal which is generally not more powerful but simply more cunning that the first one. The first part of this tale is the really interesting bit because it represents a type of animal tale that is – to my knowledge – actually endemic to the Mongolian tradition. It depicts a young foal of a camel or horse that loses his guardian and the foal’s difficult journey of finding its way in the world.